At Greenyarn, our mission is to offer revolutionary and quality fabric for consumers seeking new, eco-friendly alternatives to conventional materials. Towards this we use a new an improved material: Poliyou in our insoles to bring you Greenfeet 3 - the most advanced insoles in the world. The perfect insole admits air, drains moisture, and fights microbes. Durable enough for athletes, yet comfortable enough for daily wear. To meet these needs, Greenyarn uses three of the latest and most advanced materials in the world - Eco-fabric, Carbon Fiber and Poliyou. The science of insoles is improving everyday. Ergonomics play a big part in keeping your feet comfortable. 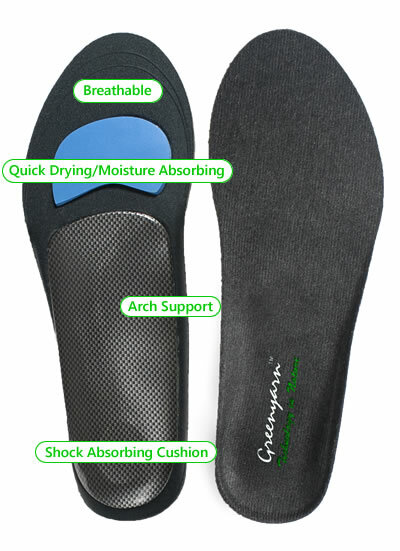 As many of our customers with flat feet, hallux limitus and other foot problems often feedback that it costs too much for an orthopedic solution, and Greenyarn products are usually cheaper and more comfortable than what their orthopedic recommends, they requested for an insole with arch support. After several rounds of design, the traditional arch support insoles are either too uncomfortable or too specific for each medical condition. Furthermore, most of them are custom made and cost way too much. Embarking on this new research project, we perfected several molds recommended by podiatrists and made Greenfeet 3. ● Eco-friendly: excess materials are reusable. Designed by podiatrists, all the design features required for orthotics are in this insole. Furthermore, the front of the insole can also be trimmed to fit several sizes. As a result, with only 3 sizes, we can fit almost all shoe sizes and this greatly reduces our cost which we can pass it on to our customers.